FoodThoughtsOfaChefWannabe: Winner, Winner, Chicken Dinner! Blessie you have 48 hours to contact me or a new winner will be selected! I am so thankful to each of you for entering. I hope that you will stick around, and continue following me, here, or any of my social media sites! I love giving you all things, to show you my appreciation for laughing with me, "lifing" with me, sharing your lives and families with me and COOKING WITH ME! Thank you so much! I am still in shock! But leaping in joy! I can't wait to have our first t-fal ever for our home! 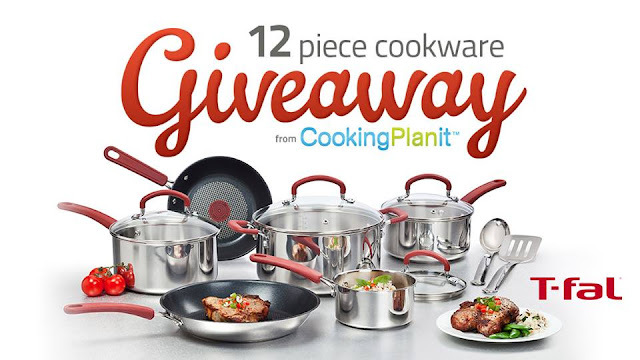 Our family thanks you, cookingplanit and t-fal for making all this possible! I am so proud to be a reader of the food thoughts of a chef wannabe blog and will be an avid reader always! Thank you for announcing the winner this way! Also thank you Blessie for acknowledging the win and Congratulations!